Forums / Long Island - Nassau / Nassau County Fire Marshals - W2LIE.net | Monitor Long Island, Inc. Does anyone have the Nassau County Fire Marshals Frequency? Im currently monitoring 453.425 and talkgroup 4021 CSQ with no NAC is this correct? Talkgroup 4021 on the NCPD 500 system is correct. Do you know which frequency on the 500MHz system is theirs? Im currently monitoring 453.425. Ok. How do i know which one is which? Im new to their system. It's a trunked system, where users share frequencies. Depending upon your scanner, you will need to enter either all of the frequencies or just the control channels. That's a bit beyond what I can explain here, so you should probably read your manual. Good luck! Again, from what I see, it's very very old and outdated. Also, the format is old and outdated looking. On the "other" site, updates occur almost weekly, or at least monthly. It's nothing nefarious or malicious - it's just that people want the latest info. I understand that I may not be looking in the right place on this site for newer info so if I am please direct me to the most recent data. Thank you. You are correct, the published lists here are a bit dated. The new site has a better format and will be easier to add info into. 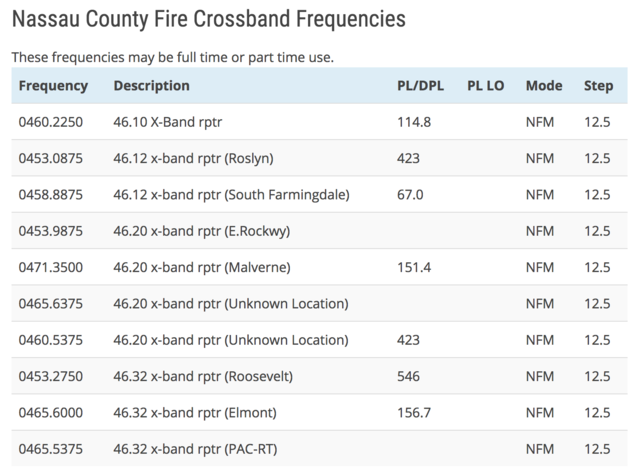 I've also integrated with Radio Reference on the new site for most frequencies outside of Nassau or Suffolk.